La Niña conditions have officially developed and should continue through January 2018 before weakening in February/March. There is now a 65-75% chance of weak La Niña conditions continuing through the winter months ahead based on the latest forecast guidance, NOAA said. There are many other factors that are considered when developing a winter forecast, but this year the overwhelming majority of these considerations are pointing to the same pattern. As it’s considered to be a ‘weak’ La Nina don’t expect exceptional snow falls. However it should still ensure above-average conditions. A great 2017/18 Japan winter coming up we hope! Below are the records (thanks to Snow Japan) for the last five seasons for Hakuba and Myoko Kogen. Myoko’s iconic ski lodge – Xmas and March specials available! The Japan Meteorological Agency’s expectation that the La Nina Japan winter 2018 may appear aligns with the U.S. National Oceanic and Atmospheric Administration which upgraded it’s forecast to a 65-75% chance of the phenomenon appearing during the Northern Hemisphere winter of 2017-2018. On 23 November JMA issued their forward one-month weather forecast between November 25th and December 24th. Hokkaido is very likely to be colder than the average December. Tohoku and Niigata looking nice too. Lower temps means December rain might become December snow. Blue = Colder than average. This is the snowfall chart issued by JMA. Hokkaido and Tohoku are very likely to have larger than average snowfalls and quite possibly Niigata as well. Nagano has not been included. Blue = Higher snowfall than average. The emergence of La Niña Japan was also observed from December 2005 to February 2006, when around 150 people died as a result of heavy snow across Japan. Snows were also heavy in the most recent occurrence of La Niña in 2011/12. Will this La Niña Japan event be our last big winter? Before we rejoice there is a sombre note. The Japan Agency for Marine-Earth Science and Technology (JAMSTEC) has stated that whilst the Global Warming Hiatus appears to have ended in 2014, they expect a start of a reversed decadal-scale phase which may strengthen the global warming impacts. However, it may still be possible that the winter from 2017 through 2018 may be an exception with high snowfall. Even if we receive ‘average’ snow, remember that an ‘average’ season in Japan is like a once in 20+ year season in places like Australia. We hope this will not our last big winter but get booking now to be sure! Imagine yourself here at Red Warehouse Myoko next winter? Book now to get the best La Niña Japan deals! Can’t find what you want? Send us a accommodation request or ask a question. Note to other website owners. Whilst we know you and your guests/clients/visitors will be excited to read about La Niña Japan in 2017/18, if you would like to use some or all of the above you must ensure that you include the below link/reference at the bottom. Thank you! Originally published as: La Nina Japan Winter 2017/18: Some Observations at Explore the Heart of Japan. Sorakaze Inc and Japan Weather Association have released WeatherJapan, a simple weather forecast application that supports multiple languages for tourists to Japan. 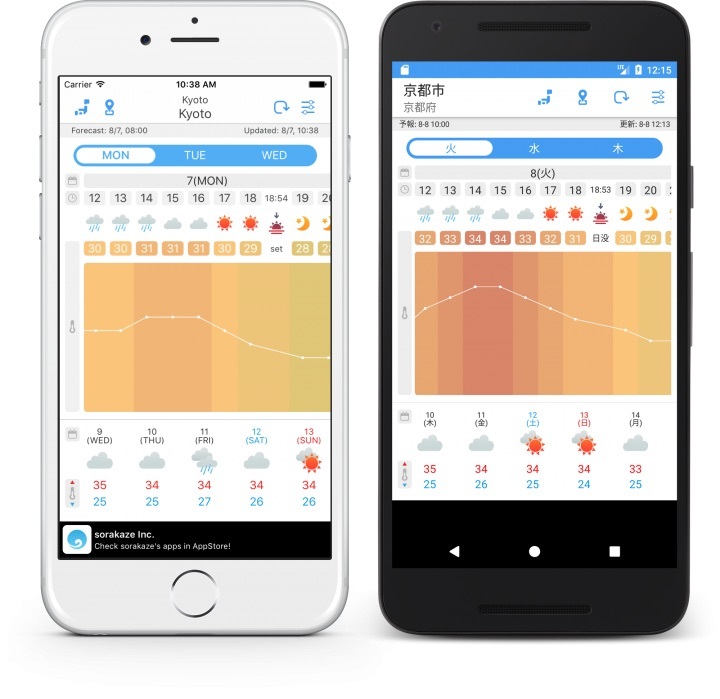 WeatherJapan is an application of iOS and Android that displays the weather forecast of Japan provided by the Japan Weather Association. Hourly weather forecasts for up to 48 hours in advance. Daily forecasts for up to one week in advance. Display of weather information for surrounding areas on the map. Search for a location by name from the area list. 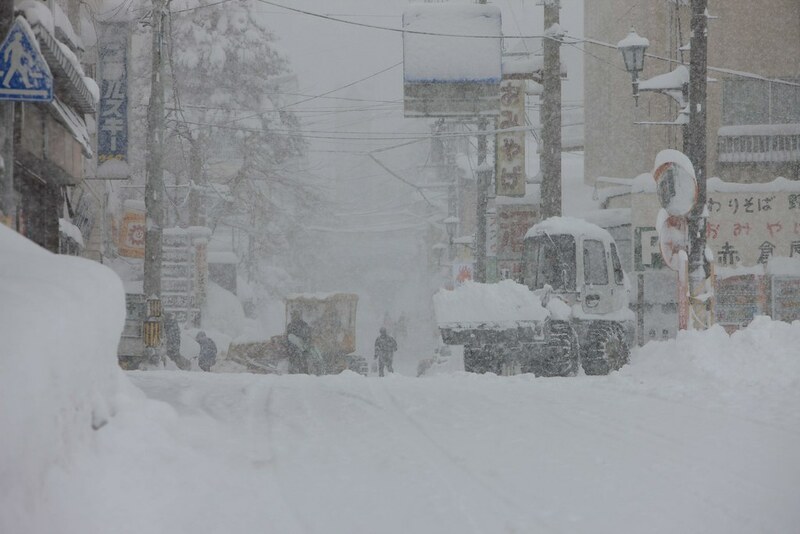 This entry was posted in Hakuba Snow Report, Snow in Hakuba, Uncategorized, weather and tagged Hakuba snowfall, Japan snowfall, Japan weather, La Nina Japan, Nagano snowfall, Nozawa snowfall.